Can you confirm these amateur observations of Atractus latifrons? Type locality: Pebas, Loreto, Peru, 03°20’S, 71°49’W, ca. 100 m elevation. 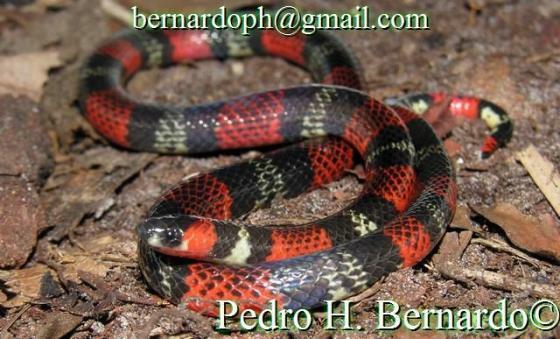 Types Type: BMNH 1946.1.6.52 (and possibly additional specimens). Diagnosis Diagnosis. Atractus latifrons can be distinguished from all its congeners by the following combination of characters: (1) dorsal scale rows 17/17/17; (2) postocular single; (3) loreal short, eventually fused to postnasal; (4) temporals 1+2; (5) supralabials six, third and fourth contacting orbit; (6) infralabials seven (n= 79), first four contacting chinshields (n= 80); (7) maxillary teeth five to six, lacking maxillar diastema; (8) gular scale rows three or four; (9) preventrals three or four; (10) ventrals 145–190 in females, 134–178 in males; (11) subcaudals 24–41 in females, 20–42 in males; (12) aposematic coloration, in preservation, with three mainly patterns [bicolor in monads, tricolor in dyads, and tricolor in tetrads] intercalating black and/or white rings separated by red interspaces; (13) ventral coloration, in preservation, similar to dorsum with complete black rings intercalating by red interspaces; (14) body size moderate to large, females reaching 566 mm SVL, males 521 mm SVL; (15) caudal length moderately long in females (10.9-14.6% SVL), moderately long to long in males (13.3–20.0% SVL); (16) hemipenis moderately bilobed, slightly semicapitate, and semicalyculate [Almeida et al. 2014]. Comparisons. Among all congeners, Atractus latifrons shares 17 dorsal scale rows at midbody and strict coral color pattern only with A. badius and A. obesus. Atractus latifrons differs from both by having snout acuminate, loreal short, prefrontals large, supralabials six, and maxillary teeth conical, lacking postdiastemal tooth (vs. truncate snout, loreal moderately long to long, prefrontals moderate, postoculars two, usually seven supralabials, and elliptic maxillary teeth with one or two postdiastemal teeth). Atractus latifrons differs from A. elaps, A. charitoae, A. franciscopaivai, and A. poeppigi by having dorsal scale rows 17 (vs. 15). 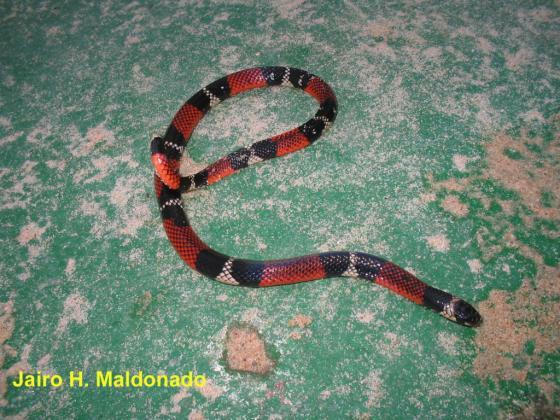 Additionally, A. latifrons differs from A. franciscopaivai and A. poeppigi by having posterior temporals two, loreal eventually fused to postnasal, and dorsal coloration with black dyads intercalated by white rings and red interspaces (vs. posterior temporal single, loreal never fused to postnasal, and dorsum generally uniform black with rhomboidal blotches covering paraventral region) [Almeida et al. 2014]. 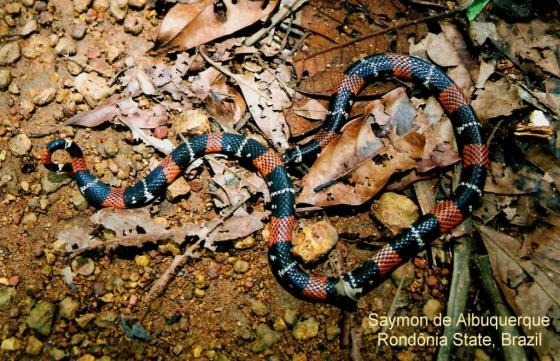 Variation: this is a highly variable species with multiple color patterns (see Almeida et al. 2014).